The hepatitis B core antibody test checks for hepatitis B core antibodies in the blood. What is a hepatitis B core antibody test? The hepatitis B core antibody test checks for hep B core IgM antibodies in the blood. Why is a hepatitis B core antibody test important? The hepatitis B core antibody blood test is used to identify a hepatitis B infection. This Hepatitis B Core Antibody Test is a blood test. The hepatitis B core antibody test, sometimes known as the anti-HBc test, hep B core IgM antibody test, and hepatitis B core antibody blood test, measures the hepatitis B core IgM antibody blood level. The hep B core IgM antibody test is used to look for an active hepatitis B infection (prior HBV exposure) in the blood. Typically, hepatitis B core antibodies are found approximately fourteen days after an initial infection and usually within six months of an infection. The hepatitis B core antibody test is often used along with the hepatitis B surface antigen test and the hepatitis b surface antibody test to check for a hepatitis B infection and/or immunity to hepatitis B. To get a Hep B core ab test near you, order online and get your blood drawn at the Quest Diagnostics lab you chose. Once your hepatitis B core antibody lab results are ready, they will be available for download. 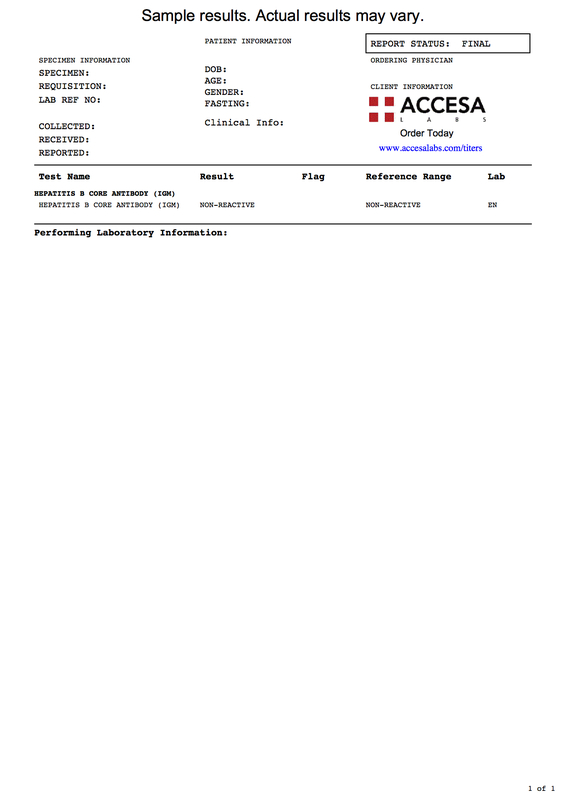 As can be seen on the sample hep B core antibody lab report above, negative results on an anti-HBc blood test will be reported as non-reactive. People may have false-negative results if they are receiving mouse antibody therapy. False-positive results may occur after the flu shot and in people with hypergammaglobulinemia, connective tissue disorders or a positive rheumatoid factor. The hep B core antibody test may not be reliable in people who have a suppressed immune system. Hepatitis B Core Antibody Test at Guaranteed Prices.